Our poll and survey merge tags help you gauge subscribers’ opinions on a topic from within an email campaign. The poll merge tag inserts a question and rating scale, while the survey merge tag inserts a single question with answer options you create. In this article, you'll learn how to add and customize a simple poll or survey in your campaign, and how to track and use the results with reports and segments. Make sure you’re familiar with how merge tags work in Mailchimp. Only the recipients of a sent campaign can respond to the poll or survey in their email inbox. It’s not possible to submit responses from a browser-based campaign page or forwarded campaign. For tracking purposes, subscribers can respond only once to your poll or survey. Responses to polls and surveys don't count toward your campaign's click rate. Poll and survey merge tags inherit the link style for the section of the campaign they're in. You can style the survey links individually, but we strongly recommend that you preview and test your campaign before you send to your subscribers to ensure changes don't interfere with the back-end code. Add a poll to a campaign to gauge your subscribers’ opinion on a topic based on a 1-10 rating scale. You’ll use the *|POLL:RATING:x|* and *|END:POLL|* merge tags to open and close your poll. To add a poll to an email campaign, follow these steps. On the Design step, click to edit the text content block where you want to add the poll. Type or paste your poll question text here. The x value in the merge tag determines the orientation of the poll in your campaign and can be either H for horizontal or V for vertical. You can add as many poll merge tags in a single campaign as you want. Just be sure to close each *|POLL:RATING:x|* tag with a corresponding *|END:POLL|* tag to keep the responses separate. When a subscriber receives the campaign containing your poll, the merge tags populate into a clickable rating scale. For example, here’s what you’ll see in the campaign builder. Here is what your subscribers will see. After a subscriber clicks a response, they’ll be redirected to your survey landing page. If your campaign contains multiple polls, subscribers will need to return to the email to answer the next question. The lowest and highest labels in the simple poll can't be changed or translated. To have more control over the language, consider using a survey merge tag. Use the *|SURVEY|* merge tag to ask your subscribers a single question with a set number of responses they can choose from. For tracking purposes, you can only include one survey question per campaign. If you want to ask multiple questions, we recommend our SurveyMonkey integration. On the Design step, click to edit the text content block where you want to add the survey. Type or paste your survey question into the editor. On average, how many plants do you keep inside your home? A survey response can be as long as you want, but the text will cut short at 255 characters when viewed in the reports. 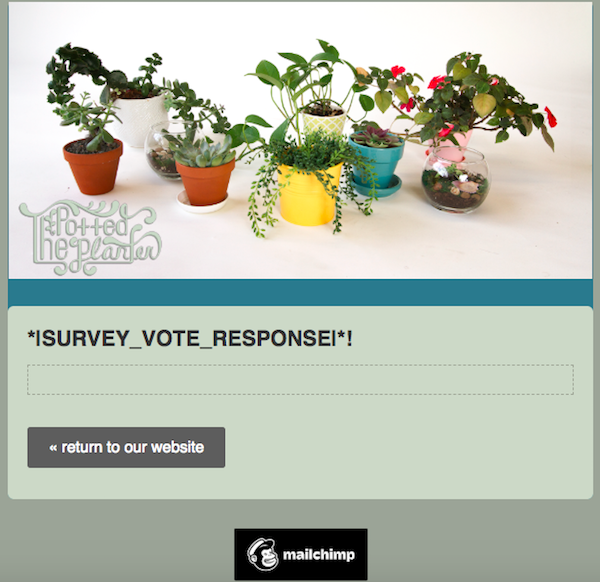 When a subscriber receives the campaign containing your survey, the merge tags populate into a clickable responses. For example, here’s what you’ll see in the campaign builder. After a subscriber clicks a response, they’ll be redirected to your survey landing page. Subscribers can only provide one survey response. Like other forms and response emails, the survey landing page is customizable. You can view or edit the survey landing page from your audience's Form Builder. Navigate to the Audience page. From the Forms and response emails drop-down menu, select Survey landing page. Click the Build it, Design it, or Translate it tabs to edit your survey landing page as needed. The *|SURVEY_VOTE_RESPONSE|* merge tag populates the "Thanks for voting" message after a subscriber casts their vote. If a subscriber attempts to vote more than once, this tag populates the "Sorry, you can only vote once per poll" message. The wording of these messages can be edited from the Translate it tab. Survey landing pages are pages we create for you by default, and are different from Landing Page campaigns. When contacts start to answer your poll or survey, we'll store captured responses in the campaign report. To view the results of your poll or survey, follow these steps. Click View Report for the campaign you want to work with. Scroll down to the Poll Results section. Under Poll results, we'll show you how people respond to your poll or survey. Here's a breakdown of what you'll see. Votes cast The total number of responses recipients have submitted. Pending votes The number of recipients who haven't yet responded. Last vote cast The day and time of the most recent response. Option column Available responses to your poll or survey. Click each response to see which subscribers chose it. Votes column The number of recipients who chose the associated option. Percentage column The percentage of respondents who chose the associated option. Last vote The day and time of the most recent response with this option. After your subscribers begin to complete your poll or survey, you can use the Poll/Survey Activity condition to create segments based on the results. For example, you might want to segment only the people who answered a certain way, or who haven’t yet responded. Mailchimp offers a few ways to send surveys to your contacts. Learn about each option and which type would work best for your email campaign.